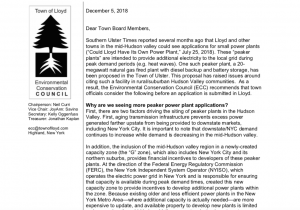 The Town of Lloyd passed a proposed moratorium on fossil fuel power plants (Local Law A) unanimously last evening, allowing the community the time to take the next critical step to address its zoning law. 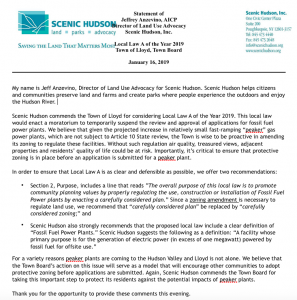 The recommendation of a moratorium for zoning consideration on 25mw (or smaller) fossil fuel plants was made by Scenic Hudson, Citizens for Local Power and KingstonCitizens.org last summer, where local communities – and not the state – have authority. The concept is appropriate for all communities in the six counties residing in the “G” Zone (see materials below for more information), and was inspired by Lincoln Park Grid Support Center, a 20mw gas-fired peak energy power plant being proposed in the Town of Ulster. The Town of Lloyd’s ECC and Town Board were the first to pursue the recommendation. New York’s highest court has held that a municipality may exclude an industrial use if doing so is a reasonable exercise of its police powers to protect the health, safety and welfare of residents and to promote the interests of the community as a whole. The Town of Lloyd is now a model community for all of us potentially impacted by these types of projects. We hope to see more communities in the ‘G’ Zone follow suit. LEARN how to update your zoning language to prepare for a possible fossil fuel power plant proposal in your community.